I have compiled the bulk of these data sheets and some other useful operational notes into a PDF. After seeing my Data Sheets end up in rental houses out here in LA I was inspired to make something a bit more robust for new and seasoned Red shooters. This document is free and can be freely distributed, but is not for commercial resale use. I needed to make a Scarlet X Data Sheet. I do this sort of thing for damn near every camera I use. Thought it would be useful for others. I'll attempt to keep it updated as Scarlet X's feature set and firmware receive updates. 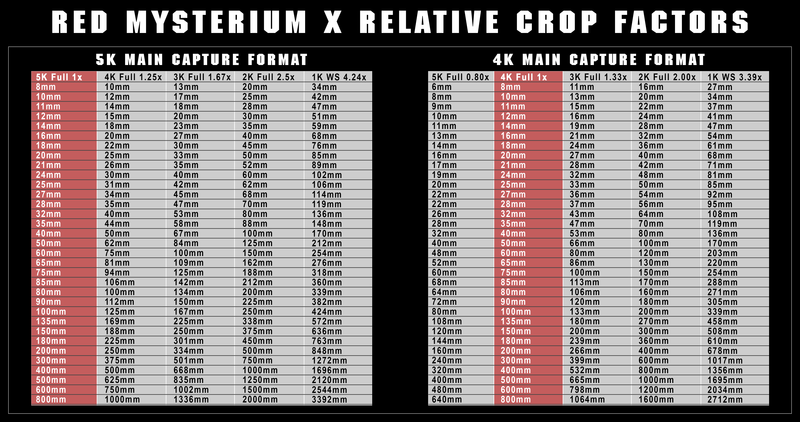 This is a key to the different Red capture formats. 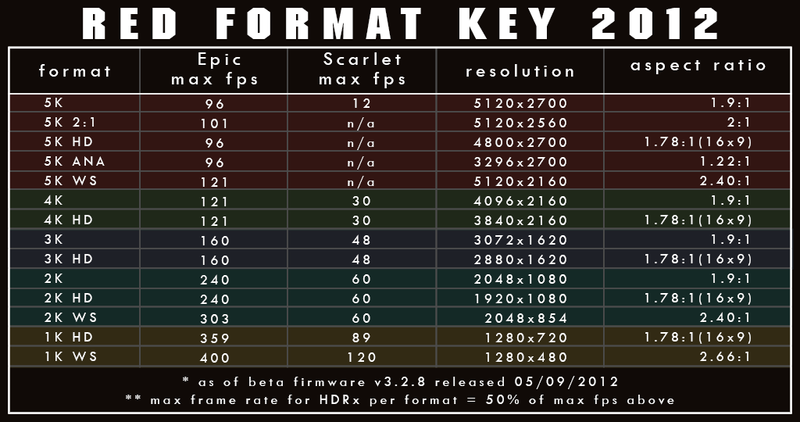 It contains the format name, max fps, resolution, and aspect ratio. I've included both Epic and Scarlet information on the same key; hopefully useful to those using Epic and Scarlet in A/B cam situations. 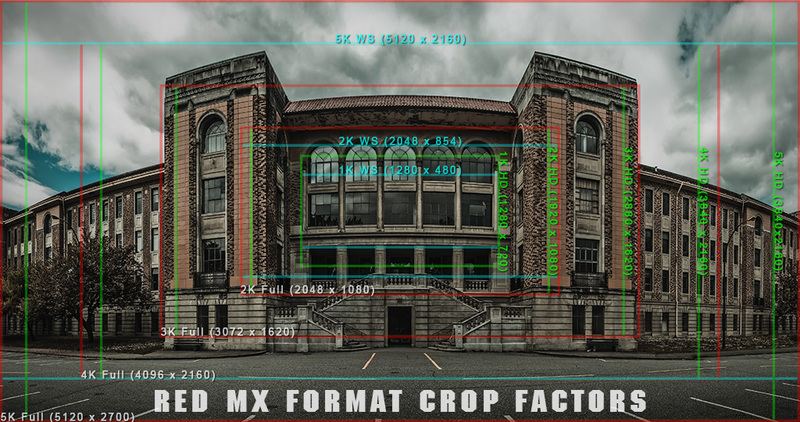 This graphic sets the "relative crop factor" at 5K or 4K. The purpose is to assist the shooter on choosing their desired focal lengths when changing formats to produce a similar field of view from their main recording format. An example: You've decided on renting a 32mm prime lens for a shoot, but know you want to shoot some overcranked 2K material to match the approximate field of view. 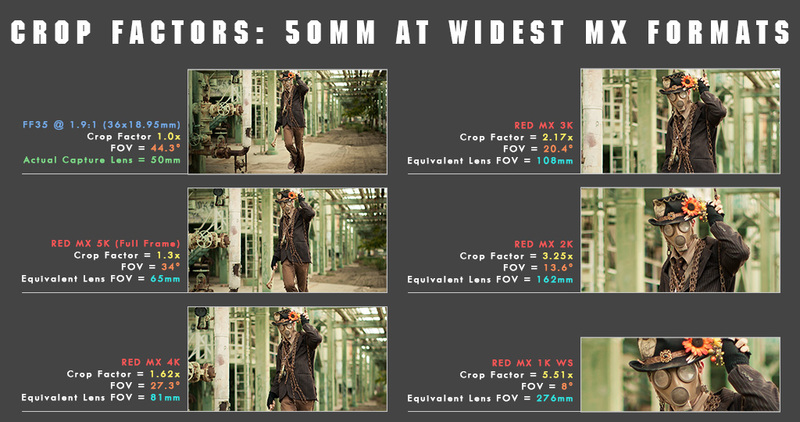 With this chart you can see that you would also want to rent a 16mm lens to produce the similar FOV and feel of 32mm at 4K. 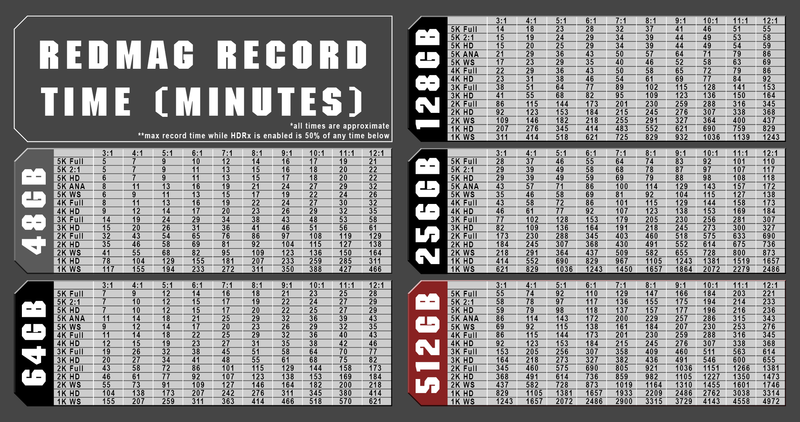 This graphic displays the recording times of all currently available recording formats and available RedMag capacities. I've listed the common production RedCode compression ratios from 3:1-12:1. Take note that the 48GB RedMag is designed for the current Scarlet X and it's max data rates. Currently we don't know how it performs on Epic. The following three graphics pertain to framing. 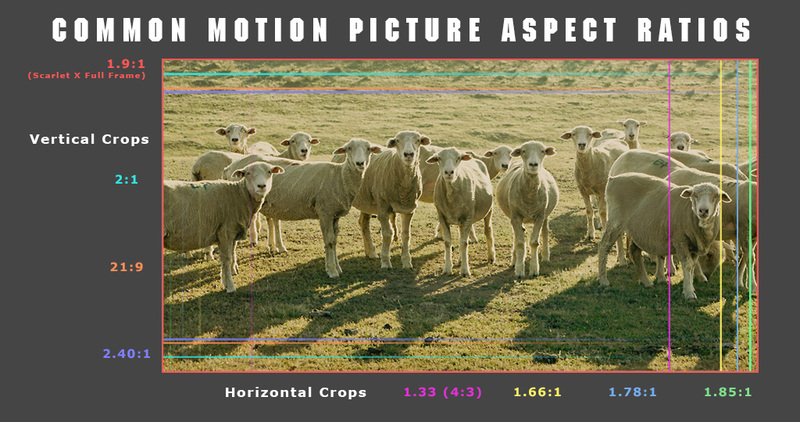 This graphic shows common motion picture aspect ratios and how they can be extracted from the full frame of the 1.9:1 aspect ratio of the Mysterium X sensor through vertical and horizontal cropping. 1) Attach the Red Body Cap to your lens mount and secure the cap with the locking collar on the mount. 2) Place your camera in a dark place or cover your camera with opaque fabric. Do not cover the vents. 3) Power up the camera. A/C Power is preferred. Black shading currently takes over 20 minutes. 4) Wait for the camera to come up to operating temperature. Usually takes 10 to 15 minutes. 5) Set your shutter speed to suite the project that you are shooting. 6) Begin your Black Shading Calibration. After it completes you may want to verify things are okay. Leave the Red Body Cap on and crank the ISO up to 12800 and make sure your focus assist tools are turned off. What you are looking for is an even black field. If for some reason it is not, likely light has some how leaked in. Remember to black shade at default after long/short exposure black shade when your finished. More convenient/flexible black shading coming later. Black shading is really only required when there are changes in sensor temperature or for long shutter speeds. It is a good idea to let the camera come up to temp before black shading. Black shading (Default) is good for most situations, including high speed. Black shading (Current FPS/Exposure) is intended for slow frame rates and long shutter speeds. Also, if you look at the system configuration screen.. the sensor temperature and shutter speed is shown for your user calibration. * tests done with the 5.0 LCD Touch and Side Handle attached. **Red has stated that "power management will be coming to the firmware" in the future which should only improve battery life. Also to note, that RedVolt XL batteries (90Wh) are on their way to be used in the QuadVolt Module. The camera will shut down for temperature reasons. Below is the behavior you should get when reaching high temperatures. At 75c the user speed is overridden and fan goes to max speed. Even if recording. At 76c the temp display will turn red. Although max fan speed usually prevents getting there. Perfect info, really appreciate it. Looks like it might be difficult shooting at 2k, ha. "...when you have eliminated the impossible, whatever remains, however improbable, must be the truth." Now if only Jarred would give us info on different aspect ratios that are available at different resolutions.